Put yourself in your candidates shoes, they may be on your career page for the first time. You have painstakingly brought them to your site via an advertisement or other means and the first point of contact has been successful. Now it's time to get the potential candidate excited about your company and the right job. This candidate searches on your page in your job postings for the right job. They are neither willing to wait nor to search for a long time, and they want to get a suitable job displayed as quickly as possible. 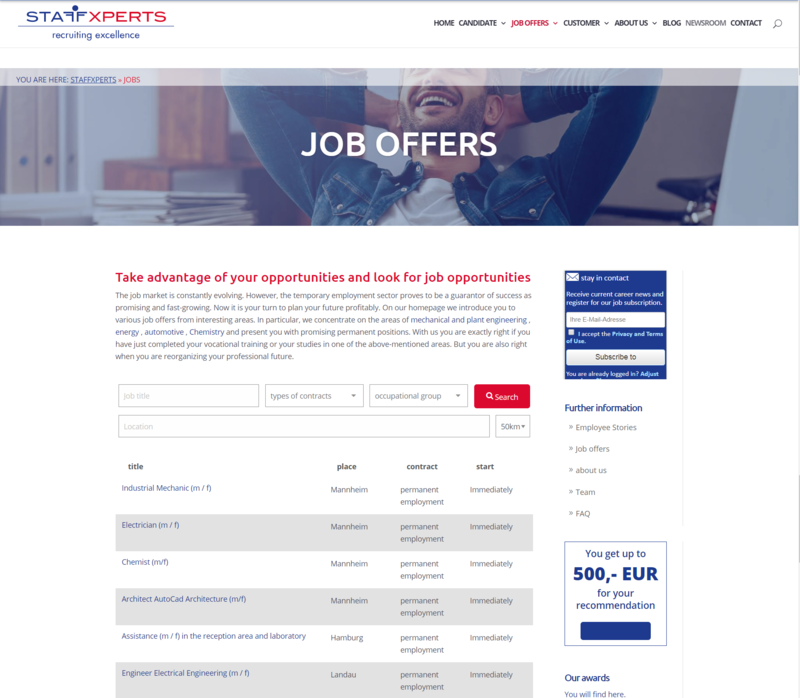 Here, in addition to a short loading time, it is advantageous if you offer a search function that allows candidates to find a suitable job faster. What role does the loading speed play? Loading speed plays an enormous role so that you do not lose candidates at this point of the job search. Remember, they have come this far and have already cost you quite a bit of budget. At this stage you do not want to lose them. But how can you find out if your site is costing you precious candidates today? On one hand the bounce rate of the job listings and the job advertisement and on the other hand the loading speed of the page. The bounce rate often goes hand in hand with the page speed of your page. In addition, it leads to a a reduced number of clicks on your page, as the candidates have lost the desire to wait for the slow-loading jobs. Not only does slow loading speed have a negative impact on the number of applicants leaving your site, it also affects your Google ranking. Since 2010, the loading speed of a website for Google has been a ranking factor and has become increasingly important in recent years. Google evaluates pages that appear to be irrelevant, which means Google can track within the search function when viewers leave a page without further clicks and after a short time. You will then return to the search results, this can be the case due to the long loading time. Google evaluates a high bounce rate as a sign that the content of the page is not relevant to the keyword you are looking for. Likewise, the clickthrough rate has an impact on the site's ranking. If there are no clicks due to a long load time, this is again counted as a sign by Google that the page does not offer any relevant content. A slow-loading page is awful for your candidates, it can lead to a negative candidate experience, and most importantly, it could prevent a potential top candidate from applying to your company. In addition, it may also be a reason that candidates will not visit your site in the future. The loading speed of your page should no longer be a challenge today. With a modern recruiting marketing software solution it takes less than a second, even with complex filtering options and hundreds of jobs in a job list. Another great advantage of modern software solutions is the analytics. They can quickly and reliably show weaknesses in your candidate journey. For example, in the form of bounce rates or CTRs, so you can understand and expose sources of error in your candidate journey and then proactively eliminate them in the next step. Talention is a modern recruitment marketing software and offers comprehensive analytics that help you to identify sources of error in your application processes and the candidate journey. To do so, our support team will help you with optimizing your processes so that you can find and successfully hire the top talent you are looking for. We would be happy to show you in a non-binding demonstration how this looks in the software for your company. Request a demo now.